With the eclipsed AboPLUS there are two ways to read eclipsed online. To be able to read eclipsed online (both in the app and on our website), you need an unlock code. You receive this with the conclusion of the AboPLUS (see invoice). The unlock code consists of two numbers: Subscription number and postcode of the delivery address, combined with an underscore. This unlock code is valid for up to two personal devices. THE ECLIPSED-APP - A TOOL FOR EVERYONE! With our new eclipsed app and the AboPLUS, you can read our magazine online as an e-paper digital with all the above-mentioned advantages at any time and anywhere and you also have access to our digitized magazine archive. 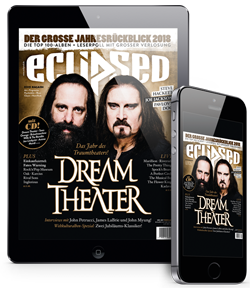 In addition there are a lot of services in the app, which are FÜR ALL ABRUFBAR until further notice, including news, XXL interviews, music tips to listen to, the "Damals" section and our new rock radar with the latest new releases. Info: These additional services can also be accessed via our website without an app on your PC. If you don't have a smartphone or tablet or don't want to use the app, you can call up both the AboPLUS offer and the additional app services (news, rock radar, XXL interviews, etc.) conveniently on your PC via our website. For the AboPLUS and the magazine archive you need the unlock code just like in the app (see information above). If you need help, email us eclipsed@aboteam.de or call Customer Service at +49 (0) 22 25 / 7085-338. We are happy to help you!